Predicting NETmundial: What does data-mining the contributions tell us? Less than two months ahead of the world football championship in Brazil, another mundial (world event) will take place in São Paolo: NETmundial. This global event will gather over 800 representatives of numerous governments, the corporate sector, civil society, academic institutions, and the technical community, to discuss possible common Internet principles and the next steps in the global governance of the Internet. Unlike in football, the ideal outcome of this diplomatic event should not be win-lose but rather (and hopefully) win-win. Nevertheless, the ‘sides’ have been taken since the World Summit on Information Society (WSIS) in 2003 and 2005, and especially since the polarised outcome of the 2012 World Conference on International Telecommunications (WCIT). The constructive diversity of stakeholder positions on myriad Internet governance issues (affordable access and cost, human rights, privacy, cybersecurity, critical Internet resources, jurisdiction, etc.) has become dominated by a polarised debate on the future governance model. Should it be continuation of the current multistakeholder model or shift towards an inter-governmental model with many variations in-between? 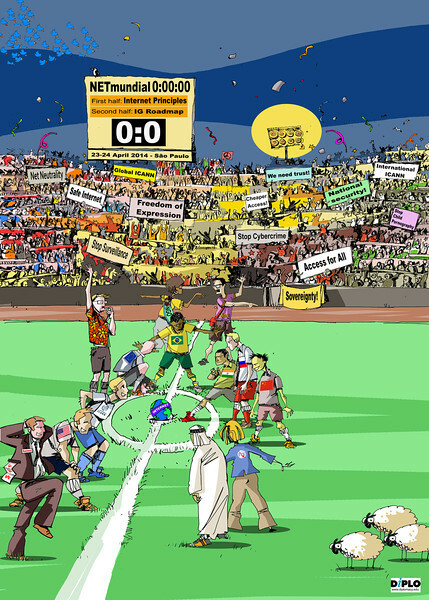 We tried to depict this polarisation in the context of NETmundial with an illustration, while re-emphasising the hope for a win-win outcome. In an open and inclusive manner, the organisers of NETmundial asked for contributions from all interested stakeholders with regard to the principles and a roadmap that should form the agenda of the meeting. A total of 188 contributions were received from all over the world, with over 20 government contributions (including Canada, China, the EU and several European countries, India, Iran, Mexico, Russia, Switzerland, the UK and the USA); unfortunately there was only one government contribution from the Arab states (Tunisia), one representing island states (Trinidad and Tobago), and none from sub-Saharan Africa. The technical community was somewhat weaker in its response; no contributions from tech communities in Europe, BRICS, or Arabic countries were submitted. The NETmundial team worked on summarising the contributions and drafting a possible outcome document. To assist the process, Diplo and the recently launched Geneva Internet Platform conducted the analysis of the 188 contributions, based on the data-mining and discourse analysis techniques successfully implemented in the IGF Language project which involved the analysis of the transcripts from the Internet Governance Forums (IGFs). We observed the appearance of certain words, phrases, and combinations of words in certain contexts from both quantitative and qualitative aspects: the frequency of occurrence of these in the contributions of each stakeholder group from each region, as well as the emotions and values they added in combination with some value words used. The interpretation of results in the NETmundial context was then based on ‘human’ knowledge and skills rather than being left to algorithms. The aim of the project is to assist the evidence-based process during NETmundial: by observing patterns and trends of positions (on topics and/or process aspects) of various stakeholders from various regions, and interpreting them in their specific context, we are able to ‘predict’ and suggest ‘zones of possible agreement’ as well as possibly confront areas which might need further dialogue. We hope the results of this research will be useful for the NETmundial deliberations; it might also possibly pave the way for similar research exercises in other areas of diplomacy. We are currently preparing a full report. But in the meantime, here are some interesting findings that can be of help for guiding the NETmundial dialogue. Take note though: this blog is longer than usual; you might want to get a coffee before you start into it or bookmark it to read later. The most dominant topic of interest to everyone was inclusiveness and participation in the Internet governance process. Almost every group had it on the top of its list of interests. Governments had a lead in this, particularly the US government, followed by Latin American governments and Tunis (as the only representative of Arab governments), with Asian and then European governments somewhat behind. Only BRICS governments gave somewhat less weight to the issue, and were more specific than others by directly calling for intergovernmental and multilateral approaches. The non-governmental sector – primarily the US technical community and Latin American civil society – emphasised inclusiveness as well. Interestingly, the Latin American technical community and its academia expressed much interest in inclusiveness, which shows the gap between the stakeholders in Latin America (possibly a reflection of their respective inclusiveness in regional and national processes). Even though there is a different interest in inclusiveness (e.g. US and Latin American parties mostly interested in a multistakeholder model with greater participation of non-governmental stakeholders, while BRICS and Asian countries interested rather in greater participation by and the role of governments), it is likely that the appeal for greater inclusiveness and participation in the global IG processes will be one of the easy outcomes of NETmundial. Privacy was another much discussed topic: almost all other stakeholders referred to privacy and data protection, especially in the context of surveillance. It was interesting to note that the African regional organisation gave the greatest weight to this issue; civil society from BRICS countries followed closely. Of the governments, the most interested ones were Asian and Latin American governments, particularly because of the issue of surveillance; European and BRICS governments lagged behind quite a bit. The non-governmental sector, especially from the Western Hemisphere, also gave relevance to privacy in their contributions, with the private sector from Latin America in the lead position, followed by US academia – which (unexpectedly?) had more interest in the issue than did US civil society (and the US government). The outcomes of NETmundial will likely put great emphasis on privacy and data protection, even if not directly linking them to surveillance. When it comes to surveillance, it was civil society from BRICS countries that gave the greatest emphasis, followed by the technical communities from Latin America and Africa. The governments of Asia and somewhat of BRICS countries were also concerned with surveillance and interception. Surveillance was timidly addressed in the contributions of all stakeholders from Europe and Latin America, and even by civil society and the private sector from the USA. Interestingly, there were several direct references to NSA or Snowden, coming from African academia, and also from the private sector in Latin America, each of the stakeholders from BRICS countries, and European civil society. Other groups did not mention these terms at all – including Latin American governments (even though they did refer to surveillance), which may signal their readiness to ‘cool down’ and turn back to a balanced diplomatic language after their outburst within the UN Security Council in August last year. It seems that the harsh language will be abandoned at NETmundial, and surveillance may find its place in the final document, probably within the privacy package. Human rights were, of course, on the agenda of most contributors, fighting for attention with privacy and security. Various institutions – such as UNESCO, NEPAD, the Council of Europe, and European Broadcasting Union – put great emphasis on human rights, including issues like censorship and freedoms. Civil society groups were the loudest, as expected: primarily from the USA, followed by Africa, Arab countries, then OECD, Asian, BRICS, and Latin American countries, with European organisations lagging behind. The US government took a lead compared to other governments, but was closely followed by European, Asian, BRICS, and Latin American governments as well, which is interesting to observe. The results signal that the draft output document proposed by the NETmundial committees, which places human rights high in the list of principles, may get general support from most of the actors. Security, particularly in the context of threats, risks, and trust (and not limited to security and resilience of the infrastructure), was intensively brought up by BRICS governments, who placed the greatest emphasis on this topic compared to their other concerns. No other stakeholder, especially government, put such emphasis on cybersecurity. Non-government stakeholders from Latin America also expressed a very high level of concern, followed by African civil society. Some OECD governments – other than continental European countries and the USA – treated security concerns seriously as well, though way less than the BRICS; Latin American governments followed closely. Private sectors from all over the world put lots of emphasis on security: Latin American companies were followed by BRICS, as well as US and European companies. Yet the corporate sector in Asia and some OECD countries didn’t seem to give much importance to security or safety or crime. Mild interest in security issues was observed with both governments and non-governmental sectors in the USA and especially in Europe. There is an evident gap in prioritising security between developed and developing countries; therefore it may be expected that the discussions at NETmundial request a more prominent place for this topic in the final document than it received in the draft. Surprisingly, one of the traditional IG issues - Internet costs and affordable access - did not receive any remarkable priority in the contributions – not even among developing countries. It was only several African stakeholders, led by the private sector, which weighted these issues, while BRICS governments barely mentioned them. Other stakeholders did not seem to be too concerned. On the one hand, it is a surprising finding, bearing in mind that the issue was one of the stumbling blocks at the ITU’s 2012 WCIT event. On the other hand, however, it is noticeable that – unlike within the ITU process – the contributions for NETmundial from the underdeveloped and least developed countries were very scarce. Depending on the physical presence of these stakeholders in São Paulo, it may happen that the issue is raised during the event. A concept prominently pushed by the ITU towards NETmundial – public goods – was supported by some of the contributions, even though it was not placed in the draft output document. Particularly, some non-governmental stakeholders from African, Asian, and Arabic countries emphasised it in their contributions, while some of the BRICS, Latin American, and European governments referred to it as well. It may happen, therefore, that the concept pops up during the event – and even in the final document – as part of some of the ‘wording packages’. It was interesting to analyse the use of terms related to globalisation and internationalisation in the context of the changes to US oversight of ICANN. In the IG context, globalisation is used to refer to a multistakeholder model, while internationalisation points to a model with a more significant role for governments. This sophisticated nuance, however, is very present in the contributions: BRICS governments, as well as civil society and academia, prefer to use internationalisation; the same goes for Latin American governments, which use internationalisation instead of globalisation. At the same time, the private sector and civil society from Latin America use globalisation, which shows the gap in positions between the government and the non-governmental sector within the region. Interestingly, the academic community in European countries gave more emphasis to internationalisation than to globalisation. Expectedly, US stakeholders used globalisation only, but often supported it by other words that wove the same context, words like ecosystem and stewardship. It is important to remember that the contributions were submitted before the NTIA announcement of the IANA transition; they could have been different had the announcement arrived earlier. Plenty of other interesting results have emerged from the research, but we will stop here for the moment, and get back with further details at a later stage. We will be reporting daily from NETmundial, so be sure to stay tuned. This text is part of just-in-time analysis of NETmundial language. It is conducted by multidisciplinary team of linguists, lawyers, journalist and ICT specialists among others. For comprehensive follow-up of NETmundial please visit recently launched Geneva Internet Platform. Terms related to globalisation: "1.2 Global collaboration The word 'global' is of critical importance. It is not desirable, or logical, to speak of more than one global infrastructure since, by definition, everything lies within a singular global infrastructure. It follows that the respective roles of the various participants in the GII have to be described in common documents that all participating parties understand. Collaboration between the various participants can best be achieved on the basis of consistent programme documents, common positioning documents, and agreed or non-conflicting basic GII terms and definitions" (ITU-T Rec. 100).